Faith-based humanitarian organizations committed to exploring unity and collaboration in the ministry of service to vulnerable and disaster-hit communities. 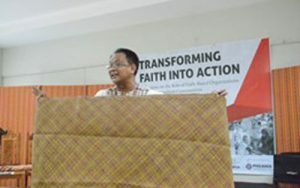 The milestone was made during the “Transforming Faith into Action” workshop, held on August 7, 2017, at the Iglesia Filipina Independiente (IFI) Conference Center in Manila. 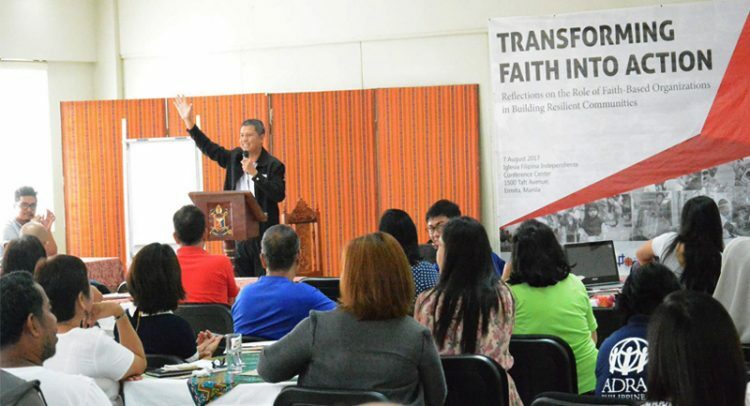 The activity gathered some 78 representatives from over 30 faith-based organizations (FBO) and local faith communities to reflect on their roles and potentials in building resilient communities. The NCCP was comprised of delegates from regional ecumenical councils, plus development programs and social ministries in member-churches. Clergy and lay workers made up the contingent of the National Secretariat for Social Action (NASSA)/Caritas Philippines and its diocesan social centers. Another organizing network was the Philippine Council of Ecumenical Churches-Philippine Relief and Development Services (PCEC-PHILRADS). Other interfaith and Christian FBOs joined the workshop, such as Islamic Relief Worldwide and Adventist Development and Relief Agencies, among others. Also in attendance was World Vision, the FBO representative to the National Disaster Risk Reduction and Management Council (NDRRMC). Some leaders from the said groups spoke during the meeting. Bishop Noel A. Pantoja, the national director of PCEC and general secretary of PHILRADS, cited James 2:17 as a basis for Christian witness. He also noted that all religions unite in the language of love and service. World Vision Executive Director Rommel Fuerte explained the nature and engagements of their organization. He also opened up about the need to solidify the FBO voice in the government, not only nationally but across the levels of governance. In his talk on the situation and emerging trends on the global and humanitarian field, Fr. Edwin Gariguez, the executive secretary of CBCP-NASSA/Caritas Philippines, said FBOs are the largest service delivery network in the world. He added that FBOs have an inherent strength in the Philippines. They are familiar with affected communities via faith congregations that have been operating, and Filipinos turn to their spirituality as a natural coping mechanism. Dr. Rommel Linatoc, program secretary of Christian Unity and Ecumenical Relations, challenged FBOs to represent the needs and aspirations of those in the margins. Calub touched on the idea of helping survivors organize and network among themselves. Concluding the activity was an action plan reflecting the group’s strong interest to unite on vital aspects. The participants pledged to hold joint learning sessions, among these on government’s move to reconfigure the NDRRMC into the Civil Defense Authority. Vigilance for this proposed amendment is only one of many planned policy advocacies. The group also committed to agree on a unity statement that outlines the nature, principles and commitments of the FBOs, possibly a document to establish an FBO consortium or network. Fr. Wilfredo Ruazol of the IFI’s Ramento Project for Rights Defenders, one of the humanitarian program representatives present, expressed hopes that an alignment of this scale could increase meaningful participation in government agenda-setting, humanitarian work and disaster risk reduction. Poverty, underdevelopment and climate change continue to challenge the Filipino people, he said. 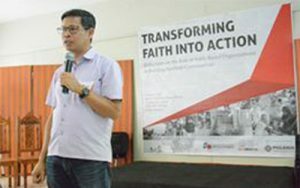 “The FBO forum brings to the fore the common role of churches and faith-based organizations in augmenting the state’s obligation in disaster preparedness, risk reduction and resilience.” Faith-based humanitarian organizations committed to exploring unity and collaboration in the ministry of service to vulnerable and disaster-hit communities.